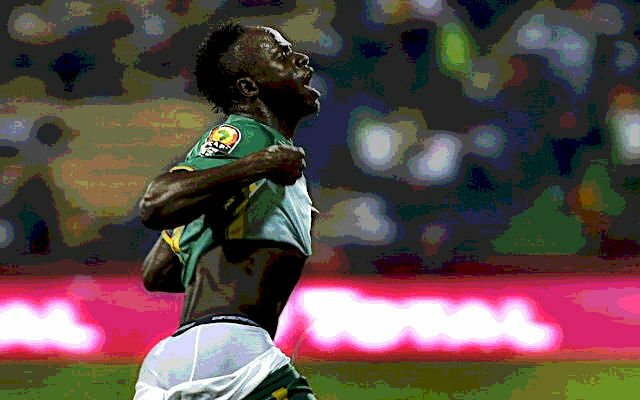 Senegal enter into this tournament as a massive uncertainty. They have potential to shock many viewers around the world with their style of play, but could also just collapse under the pressure. They have speed everywhere, physical players in the right positions, and a coach that is willing to take risks at the highest stage which was proven by some of the players left out of the squad. This team enters into Group H along with Colombia, Poland, and Japan. While Colombia are the clear cut favorites to win this group but the second spot is wide open. This second place race has potential to be one of the most heated in any group and we all know that the World Cup is where players can leave a legacy, and make themselves a lot of money in the transfer market. This Senegal team has players trying to do both of those things during this tournament. Senegal traditionally go with a 4-3-3 formation as seen above. I think that this lineup gives them the most stability in the back, physical midfielders, and forwards that all have the ability to run at any defense. It would not be surprising to see a 3-4-3 formation to better fit with their stronger center halves, or if they need a goal it would give them more of a presence going forward and pressing higher up the field. The goalkeeper position is the weakest on the field for the Lions of Teranga. 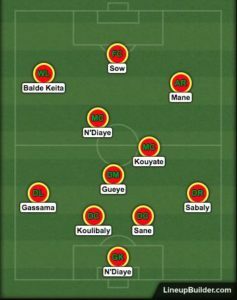 This position is one that is vital for any team to have a reliable player, as seen in the Champions League final, and Senegal are hoping that Khadim N’Diaye will become that player leading up to the tournament. The whole defense will be anchored by Kalidou Koulibaly, the strong center half will have his hands full throughout the group stage and is also playing for a potential record breaking transfer for a defender. He is strong in every sense of the word and his game sees very few weaknesses, but that is an area where the rest of the defense could set them back. Salif Sane is another tall defender with a lot to prove, he made 32 appearances for Hannover this past season, scoring 4 goals while only keeping 4 clean sheets. Youssouf Sabaly has attacking prowess while racking up 5 assists for Bordeaux this past season, which could be great to add an additional attacker at times especially if they revert to the 3-4-3 formation. The Midfield is a tale of two stories. First comes the defensive side of the midfield, anchored by West Ham’s Cheikhou Kouyate and Everton’s Idrissa Gueye they have two athletic strong midfielders to be able to defend and play in transition. These two will be the stalwarts of the midfield and if they can limit the pressure put on the back line it will be vital to the Lions advancing out of the group stage. In the attacking midfield role is where you see a lot of uncertainty. The two midfield N’Diayes can both play, while I think Alfred N’Diaye gets the nod after appearing for Wolverhamption 26 times in their promotion campaign. Overall, I think that the midfield of Senegal will determine how deep they can make a run in this World Cup. The attacking third is where this team gets really exciting. They have speed everywhere, including Sadio Mane one of the hottest forwards in the world right now. Moussa Sow has proven himself to be a goalscorer with 23 goals over the past two years in the Turkish SL for Fenerbache and Bursapor, and Balde Keita is a player that can turn nothing into something with his pace and skill. From there you have to look at Mame Biram Diouf from Stoke City, the 6’1” forward is athletic and wins balls out of the air which would complement the speed on the wings very well. You could also see Sadio Mane take a more central role as an attacking midfielder to open up more space and give him the ability to create for his teammates. There is a lot of room for flexibility with the attackers on this team and I am very interested to see how they line up when the tournament starts. With the solid midfield anchors and Koulibaly giving the defense an extra boost from his performances, I think that the attackers will run rampant during the group stage and earn a second place finish in the group. Advancing out of the group stage will be an accomplishment and this team has the potential recreate their success from 2002 and reach the quarterfinals. This is the team to watch in this World Cup and they could turn heads throughout the tournament.